A few months ago I had the opportunity to review La Gloria Cubana’s new “Artesanos Retro” cigar, and what I liked most about it was the Honduran Connecticut seed wrapper. It’s a tasty leaf, so it’s easy to see why Alec Bradley has gone the same route with the American Classic Blend. Alec Bradley has some experience with Honduran tobacco. Their big hits in the past couple of years (including an impressive No. 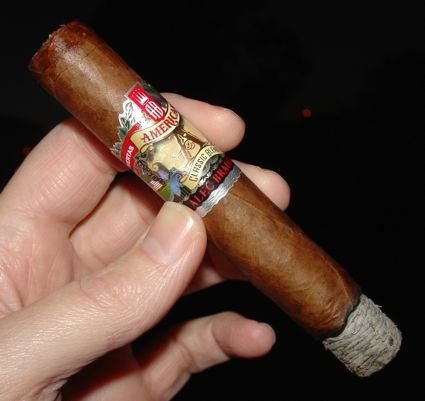 1 for the Prensado in Cigar Aficionado’s 2011 lineup) have been from the Raices Cubanas factory in Honduras, so it’s not a huge surprise to see an unusual Honduran strain on the American Classic. This blend was reportedly designed to mimic the style and evoke the flavors of cigars favored by Americans in the early part of the 20th century, when Tampa was King and cigars with double claro or candela wrappers were labeled “American Market Selection.” Wrapper shades darker than this were called “English Market Selection,” and the darkest cigars were called “Spanish Market Selection.” World markets and the tastes of smokers worldwide have obviously changed, but the American Classic Blend takes a step back in time. The wrapper on the American Classic is somewhat dry and papery. It’s darker and more weathered in appearance than Connecticut Shade, and it seems a bit thinner. The rough texture of the binder shows through, giving the stick a slightly bumpy appearance. The cigar is finished in Cuban flat-head style with a triple wrapped cap. Staring down the business end of this cigar I notice that the bunch appears to be partially booked. The draw was fine, however, and the cigar burned perfectly, so perhaps the evils of booked filler leaves are exaggerated. And like many other cigars using Connecticut Shade, this one left a solid light gray ash. 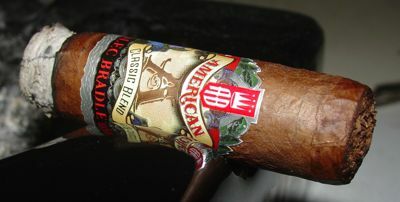 The Alec Bradley American Classic starts up with a toasty flavor common to many mild-to-medium bodied cigars, but the spice on the nose sets this one apart from run-of-the-mill Connecticut Shade smokes. It has the perfume of Connecticut Shade, but it’s sharper and less flowery. It blends extremely well with the toasty and woody foundation flavors. The mid-section brings a bready note as the spice on the nose dies down. The sweet spot here is almost exactly at the half-way point of the cigar, where the cedar and bread flavors are delicately balanced and the result is delectable. Unfortunately these flavors dissipate around the two-thirds point and the smoke becomes a bit hot and burnt tasting. Maybe in my zeal for that bready note I was pulling a little too hard, but I deliberately slowed my pace while smoking the second cigar and had the same experience. 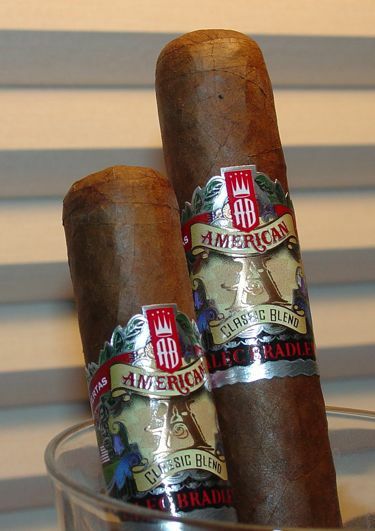 The American Classic has the mild and floral sweetness of a high quality Connecticut Shade cigar, but an added complexity that I found quite enjoyable. The combination of toast and bread and soft spicy cedar make it a great smoke to pair with a morning cup of coffee. Most of us weren’t around for the days of “classic” American cigars, the days of Thomas Riley Marshall’s “good five cent cigar.” (I shudder to think about what my grandfather would say about a 15 dollar stogie.) At around $4 USD this one is a bit pricier than Marshall’s budget smoke, but by today’s standards it is still a relatively good value. Give it a shot one of these sunny spring mornings. Sounds like it’s worth a try at that price, but since I’ve got some Perdomo Champagnes and EPC New Waves coming it might be a liitle while before I do. My question is how does anyone alive now know what cigars tasted like at the turn of the 20th century? 😉 Thanks for the review. I often wonder that myself … but cigar making tends to be a family business, and I’m sure that someone like J.C. Newman passed down his impressions of tobacco from that time to his sons. The experience itself is impossible to transmit, but I think among people who really know tobacco it might be possible to describe the cigars of years gone by. Or at least I like to think so. I was hesitant to buy into these, but now that I’ve had several, I have found them to be a very enjoyable morning smoke. Certainly not a “wow” cigar, but worthwhile nonetheless, and a good value. Thanks for helping to nudge me toward them. Now I need to try some AC Sun Growns.